in an era where movie posters were iconic. No one will ever forget that ending: the Death Star explodes, the evil Darth Vader goes reeling off into space, and the band of rogue heroes – Luke Skywalker, Han Solo, and Chewbacca the Wookie – are decorated with medals of honour by Leia Organa, Princess of the now destroyed planet of Alderaan in an elaborate ceremony. When audiences left the theatre in 1977, they were left to wonder: What’s next? It would take three years, and the dawn of a new decade for that question to be answered. The final resolution would not come for three more years after that, with the final act in a three-piece drama that captivated the world, and left no one disappointed. 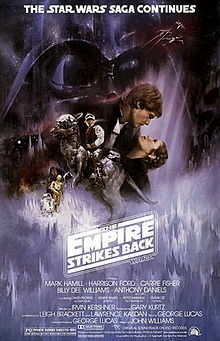 The 1970s may have ended with “Star Wars”, but it was the 1980s that saw “The Empire Strikes Back” and “Return of the Jedi”, the next two parts in the saga created by George Lucas, take over pop culture. One day, I was watching TV and I saw this commercial for a science fiction movie, that was just coming to theatres. I honestly thought it was the much-awaited sequel to “Star Wars”, but it in fact was not. Finally, there was no mistake about it. The sequel to “Star Wars” was coming to Lethbridge, and we were going. It was such a big deal that my sister and I got together with our cousins Carl, Nina, and Doris and all went to see it at the beautiful Paramount Theatre in downtown Lethbridge. The movie did not disappoint. It resumed the story a few months after the destruction of the Death Star, with the Rebel forces on the ice planet of Hoth. Ultimately, they would make it off that space ice cube, and re-group to battle the Empire, but not before Han Solo was captured and encased in carbon, and Luke pursued his training as a Jedi Knight with Yoda, his newly-discovered Jedi Master. The crescendo was a showdown with Darth Vader, where he cuts off Luke’s hand and reveals the darkest of secrets – Darth Vader is Luke’s father. The end is not very hopeful, as Luke is outfitted with a prosthetic hand, and they try to figure out not only how to defeat the Empire, but rescue Han Solo. And Luke is left wondering if what Vader told him is actually true. At one point it is also said “there is another” and my sister and I thought that naturally referred to Luke’s son, because that always seemed to be the case back then. The father always left a legacy. One of the things I remember most after “The Empire Strikes Back” came out was that trading cards soon followed. It was Grade 6 and every week when my Dad took me to church, we would stop at the Red Rooster convenience store in Coaldale where he would buy himself cigarettes and buy me hockey cards or in this case “Empire Strikes Back” cards. My good friend David Perlich also bought them, and we often traded. He completed his set first and put them all in one of those photo albums with the sticky page covered by a clear plastic sheet. I too completed the set and wanted to do something similar to what Dave did. However, I was worried that sticky page would damage the cards. My mom had that happen with one of the school pictures of my brother. So, she suggested using black picture corners, which had no adhesive that touched the cards. She also got some thick cardboard matting that we cut into 8.5-by-11-inch sheets and punched three holes in to put in a blue three-ring binder I had. It looked pretty cool. They would release three different series of cards, and we collected and completed all three. I used to also trade cards with my cousin. We would get together and play this game where we would flick cards at the bottom of her closet door. The one of us with the card closest to the door, without going under, got to keep both cards. It was a lot of fun, and tended to even out over time, as we won and lost each other’s cards. There was one I needed to complete one set, but she would never flip that card. I suspected it was because she did not want me to complete my set. were pivotal in marketing and promoting movies. Eventually, word began to leak out the third and final part of the Star wars trilogy was going to come out. Dave was really into science fiction and I think read in “Star Log” magazine that it was coming out in 1983. Initially, he heard the name of the movie was going to be, “Revenge of the Jedi”. 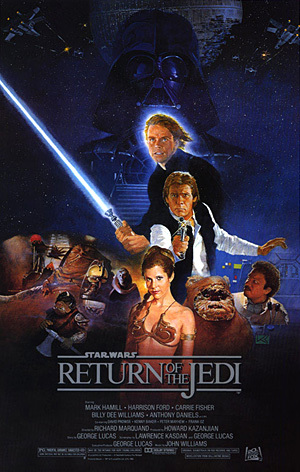 However, we later heard it was changed to “Return of the Jedi” because Jedis do not seek revenge. Finally, it had arrived and my sister and I went on opening night. We had learned from “Star Trek: The Motion Picture” and other movies about how much it sucked to wait in line outside. So, we got there early and we waited in line at the Paramount, but we were at the front, almost first in line. It was awesome. Again, the movie did not disappoint. Luke Skywalker is now a fully trained Jedi and uses his powers to free Han Solo from the clutches of Jabba the Hut. Meanwhile, the Empire is building a new, deadlier death star. The Emperor himself goes to it, intent on luring Luke into a trap so he can turn him to the dark side, as he had done with Luke’s father. It is then revealed, beyond a shadow of a doubt, that Darth Vader was once Anakin Skywalker, Luke’s father. Once Han Solo and Princess Leia are rescued and back in the Rebel camp, they plan an assault on that new death star. The giant space weapon is surrounded by a shield emanating from the forest moon of Endor, so the Rebels journey to Endor’s surface to knock out that shield. They are aided in their efforts by the Ewoks, inhabitants of Endor who resemble living teddy bears. At the same time this battle is raging on below, Luke confronts the Emperor and Darth Vader on the death star. The Emperor has Luke on the verge of giving into his anger and beginning a descent to the dark side, when Darth Vader intervenes, ultimately saving Luke’s soul. When the Emperor realizes he will never turn Luke, he tries to kill him. Again, Vader intervenes, killing the Emperor but suffering fatal injuries in the process. Luke removes Vader’s mask, so Vader can see his son with his own eyes. He had saved his own soul in the end. The shield is disabled and the Rebels, led by Lando Calrissian, destroy the death star. The movie, and seemingly at the time we thought the series, ended with a celebration on Endor. Leia tells Han Solo that Luke is her brother, and she is in fact "the other". One of the closing moments sees Luke greet the spirits of Ben “Obi Wan” Kenobi and Yoda, and have his father now join them, not as Darth Vader, but as Anakin Skywalker, wearing his Jedi robes. So everyone lives happily ever after – or so we thought. When I entered the University of Alberta in 1987, I lived on the 10th floor of Kelsey Hall. Every floor had a common area, or lounge, with a TV and cable. We also got pay TV and one of the movies that was always on was “The Return of the Jedi”. I may not have seen it in its entirety, but I saw bits and pieces playing in the lounge for a couple months. There really is nothing like the original “Star Wars” trilogy. It had an unparallelled effect on the culture of the 1980s and beyond. From the special effects pioneered by George Lucas’ “Industrial Light and Magic”, to the onset of merchandising to the very words and phrases entering the English language, the trilogy’s influence is profound. However, at the end of the day the special effects, and the seemingly endless action figures, cups, cards, pens, shirts and on and on, are not what make the Star Wars movies so special. It is the story George Lucas tells and the engaging, compelling performances by Harrison Ford, Mark Hamill, Carrie Fisher and the others. The power of Star Wars is evident in the fact these three original movies were re-mastered and re-released a decade later and still attracted mass audiences. They spawned a second trilogy, which actually takes place before the original movies, and were also hugely successful, although they did disappoint a lot of die hard fans. Finally, it is evident in the fact a new set of movies has been released, with the next instalment coming out shortly. I find it interesting, and ironic, that the same questions I had in Grade 6 in 1980 about what was going to happen in the next “Star Wars” movie are the same ones being asked today. We are all left to wonder: What’s next? So, unlike so much other stuff from the 1980s, for Star Wars the adventure actually continues in 2017.